Kamla Persad-Bissessar celebrates her election victory Monday in Port-of-Spain, Trinidad and Tobago. (CNN) -- Trinidad and Tobago made history Wednesday when it swore in Kamla Persad-Bissessar as the Caribbean nation's first female prime minister. 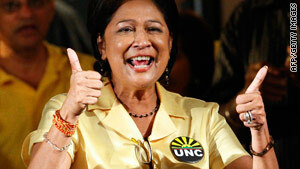 "Change has, indeed, come," Persad-Bissessar, 58, told a boisterous crowd in Port-of-Spain. "Today, we start the work of transforming the hope and promise of change into the reality of change." Persad-Bissessar was elected Monday when her People's Partnership coalition won 29 of the 41 seats in Parliament. She defeated incumbent Prime Minister Patrick Manning, who had been in power for 13 of the last 17 years. The new prime minister already has her first test: heavy rains have pounded the twin island nation on Wednesday, resulting in floods in several parts.